Botanical Significance: This tree was used to make an intoxicating drink that was likely used in religious ceremonies such as those for sacrifice and self-mutilation (Flannery 1982). Sap was drained from the tree and fermented to make the drink. The tree also bears flowers that are white or bright red. Red was a color sacred to the Maya (Grube 2001). 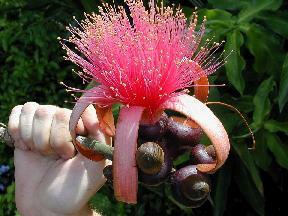 The size, color, and shape indicate that the flower on a headdress may be that of the amapolla tree. Notes: Syn: Bombax ellipticum H.B.K.